This Ultra Fine Stropping Belt Kit was designed to work with the Ken Onion Edition Blade Grinding Attachment. The kit includes 2 Ultra-Fine cloth belts and 2 honing compounds. 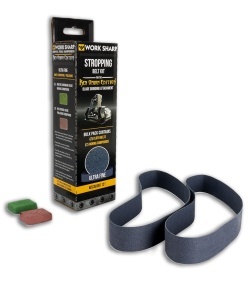 Cloth belts are more durable and consistent than leather, and provide an ideal surface for honing and polishing. Item includes a green chromium oxide honing compound and a red ferric oxide polishing compound.